Drying is an energy intensive operation, accounting for 35% of the steam energy requirements of an integrated paper mill. Drying capacity is a function of the number of steam drums in the line. As lines have been made to run faster, often additional steam drums are required. 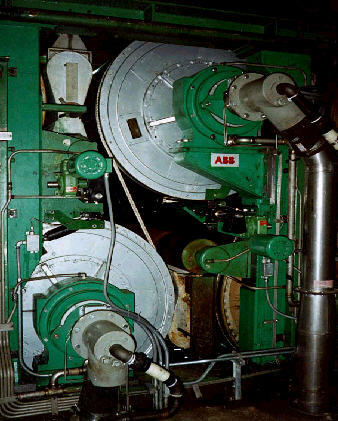 Infrared dryers can be placed along the line to compliment existing steam drum dryers. This can give a boost to drying capacity and allow the speed increase of dryer-limited lines, without the high cost of lengthening the line with steam drums. The IR energy penetrates the paper and dries from the inside out. There is no contact so on some types of paper, product quality is improved. When used with cross-directional moisture scanning (CD), the burners can be staged to get correct/ even drying across the web. Bands can be as narrow as 3″. Burners are made of metal or ceramic materials that heat up and cool down very quickly, allowing the tight CD control, and improving safety. They cool below ignition temperature as quick as 1 second after shutdown. They heat up to operating temperature in about 10 seconds. The IR wave-length is more acceptable to paper than that of electric, so it is more efficient in addition to being a lower cost fuel. Gas burners are considered 30 -60% efficient when measuring the paper temperature before and after the burner. If used in conjunction with gas fired convection drying, efficiencies increase to 65 -80% by keeping the air above the surface of the paper moving. Production increases of 10 -20% are common. 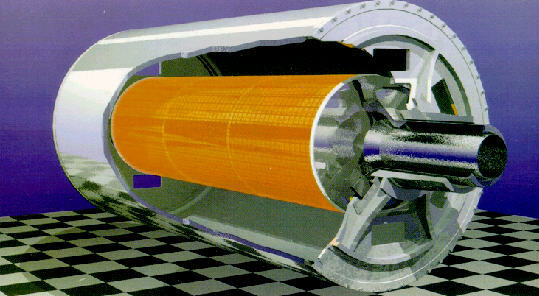 The Andritz dryer is a unique in-drum radiant heater system that increases drying capacity by increasing the surface temperature of a drying drum/can over what is possible with a steam system. The gas fired drum is a direct replacement for an existing steam drum and provides drying via direct contact with the hot surface of the drum. The Andritz GHPD (Gas Heated Paper Dryer) is a one-for-one replacement system with existing steam cylinders. They are installed in pairs to produce an even drying effect on both sides of the paper. Production increases have many variables, but 5 – 15% line speed increase per pair of GHPDs installed is typical. Exhaust heat from the IR burners can be captured for use in heating pocket ventilator air for additional efficiency improvements. Andritz GHPD were installed at Corrugated Services LP (CSLP), located in Forney, Texas. Click link to see the Case Study. To view a presentation on the Andritz GHPD in PDF format. This presentation, made by Dave Gamble of Andritz, was made to the Energy Solutions Center in February 2003. It includes some case study information in addition to the CSLP study linked above. Source: Graphic and Features and Benefits from Aqeel Zaidi Union Gas IGT CIGC July 2000 Presentation; Andritz GHPD presentation to the ESC 2/2003.